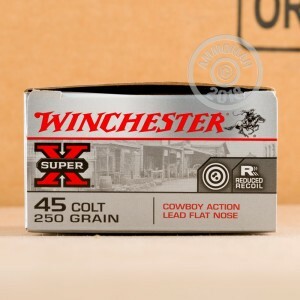 This .45 Colt ammunition from Winchester is designed for cowboy action shooting and general purpose target shooting. 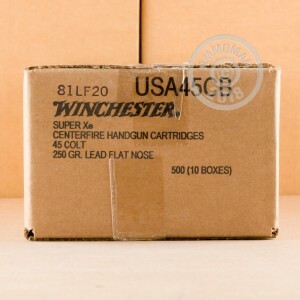 Each cartridge in this box of 50 fires a 250 grain lead flat nose bullet suitable for both revolvers and rifles. 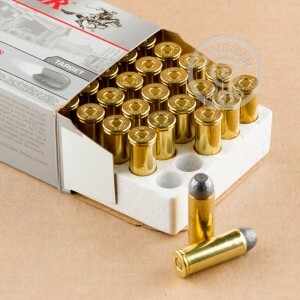 Not all indoor ranges permit lead nosed ammunition, so check before ordering if you plan to shoot indoors. These cartridges are made at Winchester's new ammo factory in Oxford, Mississippi using non-corrosive Boxer primers and brass cases. Order now at AmmoMan.com and get free shipping on all purchases over $99!